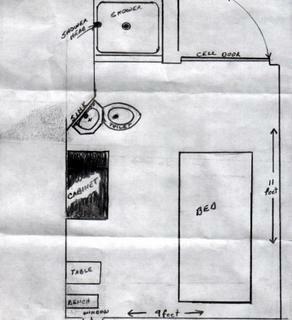 Ohio Death Row Inmate: My Cell, My "house"
Since "Scotland" is now posting this as a "blog", I think I'll sketch my cell, to give y'all an idea of what my cell looks like from the cell door, looking in, and a diagram of the cell. 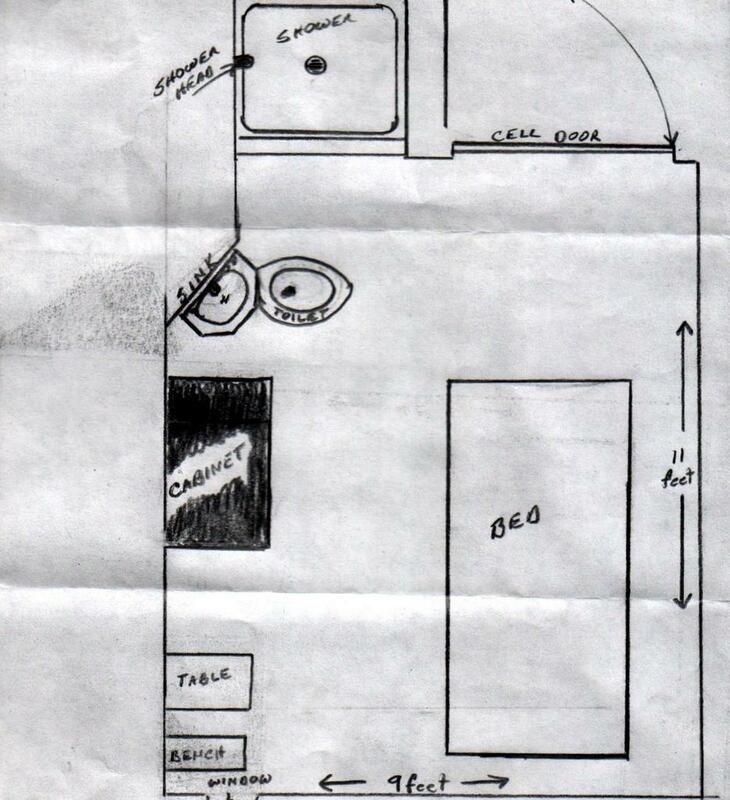 The cell Kenny is in, and the one I'm in, are mirror (reversed) image of this one. They are all the same, but half are the exact reverse of the other half. That didn't take long. I just did the diagram, with basic things in the cell. The dark things on the table, footlockers, bench, cabinet, bed, etc.......are towels and blankets that we in to cover up the chipped and rusted metal. The bed is the only metal thing in the cell that isn't that bad, but the cabinets and footlockers are just rust buckets! I've sanded down all of mine with emery boards, painted them, then varnished them. I even put a piece of chipboard on the top of the footlocker, (the lid), and painted it dark blue to match my towels and blanket. I spend 221/2 hours a day in my cell, so I fix everything. a lot of guys just don't care....it's a prison cell to them. But, I just can't live like that....it's too depressing. 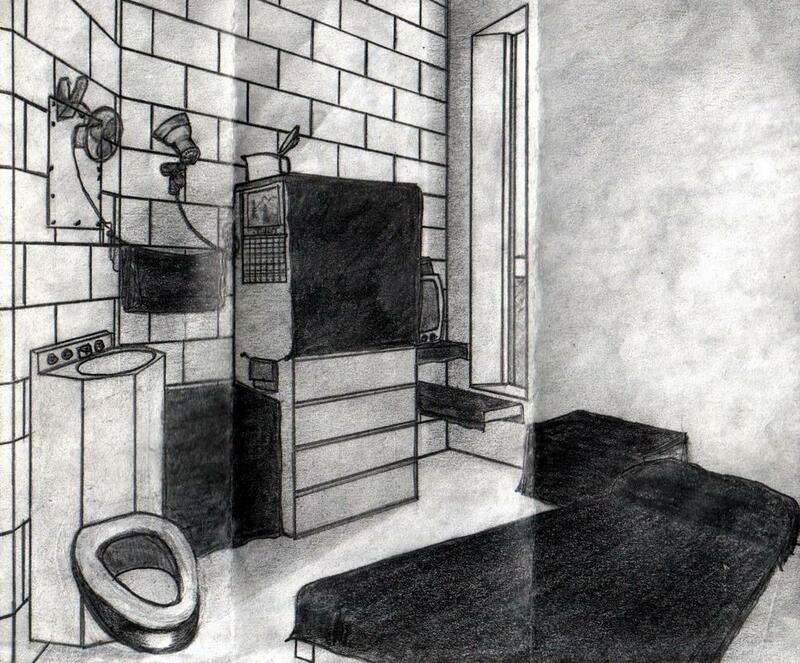 some would say I'm "institutionalized", and maybe thats true, but it's MY living space, and I refuse to suffer in it. It helps keep my sanity. I do LOTS of things to try to be comfortable! I put baby powder all over myself when I get out of the shower, so my clothes don't stick to me. I have a desk lamp, so I don't have to sit under the harsh florescent lights on the ceiling. I re-bind my hard cover books when they get old, and paint the covers. I wear nylon boxer shorts because they are comfortable. I shine my boots, iron my clothes, and handwash all of my nylon clothes. I put my locker box up on cans to make a desk out of it, and stack books up for a seat, and put my pillow on it when I sit there. I keep photos on my desk.....and currently they're of my kids...........and the painting of the barn is on there too. I painted gold trim on my alarm clock, and on my ashtray. I make little oil lamps and use baby oil for fuel...........so long as I keep the flame short, it'll be a burn clean. They're good for "atmosphere", and for when stroms knockout the power. And I write because I have no one to talk to. When I answer letters, I may write for 2 or 3 hours, or I may write one page..but, I write because I want to express myself, and it helps me: emotioanlly. 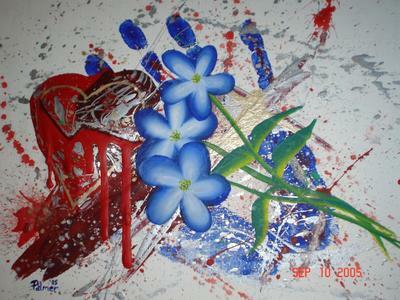 When I'm not writing, or talking to someone on the phone, I talk to "noone" in my cell.........yeah, I talk to myself. But, I carry on in a normal way, in an abnormal situation. (I'll bet that "Scotland" will be happy when I have more people to write to, and to call. (SMILE). But I know she likes to keep busy.........and she likes me, and likes to read this stuff as much as those who log onto this site. What can I say? I have to do whatever it takes to survive.